Goldie mask is from Gypsy Renaissance's Sequins & Sparkles collection. 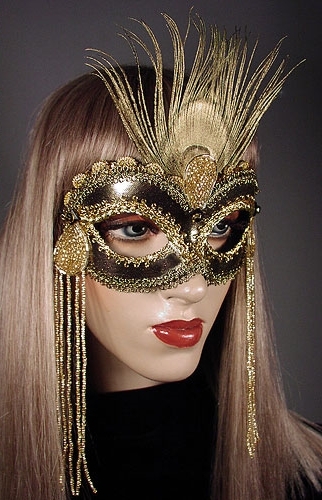 Goldie is a gold masquerade mask with peacock eye, teardrop dangles, and gold trim. Goldie mask is covered with liquid gold fabric and trimmed with metallic gold braiding. Mask is adorned with a metallic gold painted peacock eye. Mask is embellished with gold glass beaded teardrop appliqués and glass beaded fringe. Finished with black jet jewels and gold cabochons.